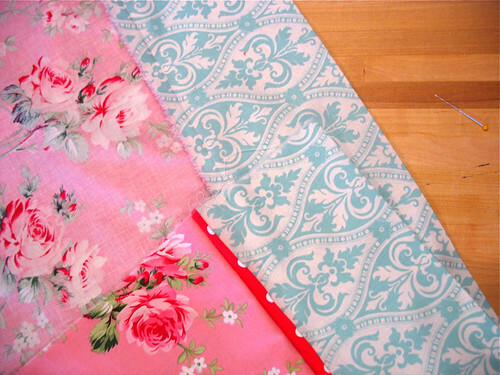 Banish percale forever - Stop staring and start sewing! One of my daughters just moved into her own room so I've been wanting to spruce it up a bit for her. It's the guest room (she has to move out when guests come) and it's cute but getting boring. I've been wanting to make some pillow cases and I'm glad I finally did because it was soooooo easy and fast and the outcome is so incredibly better than store bought cases. If you want to try it here's how I made mine. 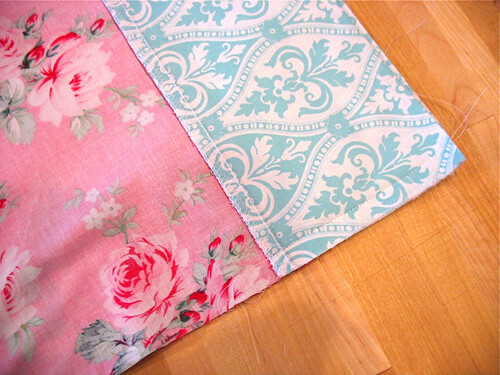 I used 3 fabrics: the pink is 41 x 25 inches, the blue is 41 x 10, and the red is 41 x 1.75. I'm just going to refer to the fabrics by their colors even though you will probably want to try different colors for yours (but if you want to copy this one then that's okay too!). 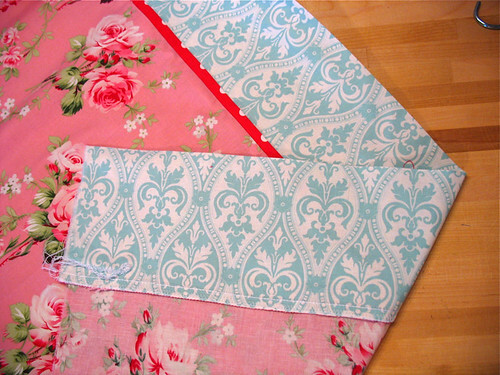 Fold the red and blue fabrics in half and press. 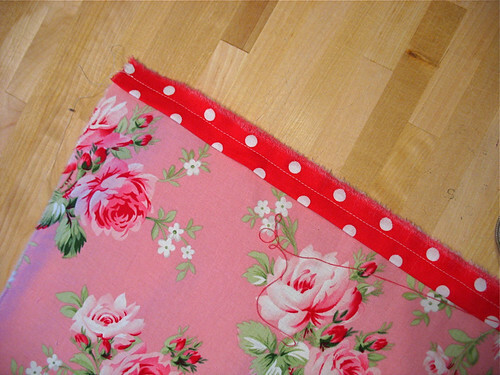 Use a 1/2 inch seam allowance and stitch the red strip of fabric to the edge of the pink fabric (matching raw edges). 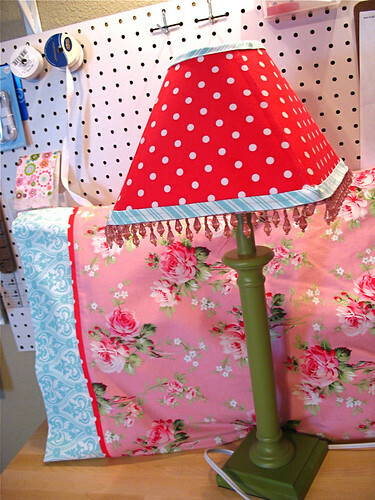 Now pin the blue fabric on top with the red fabric sandwiched in between and raw edges even. Stitch in place (I usually flip it over and follow the previous stitch line just to keep it all even). 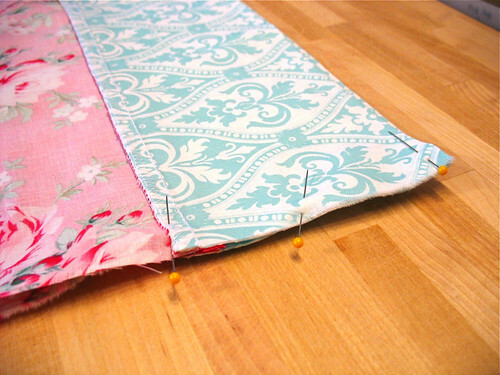 Now clean your edges by serging or zigzagging and press your seam out nicely. 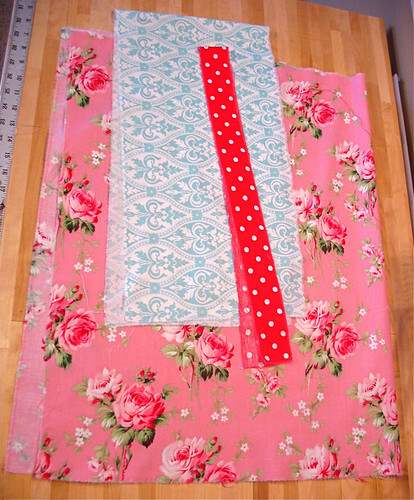 The red strip should be pressed towards the top (the blue fabric). Looking good! 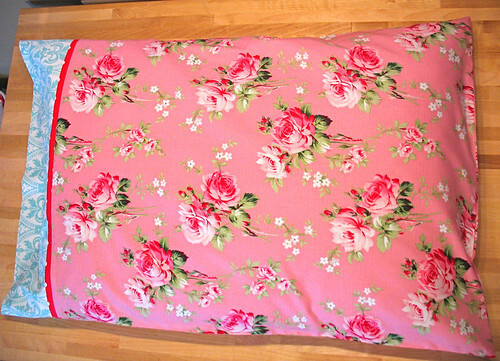 Now fold the whole pillowcase in half and pin the edges together. 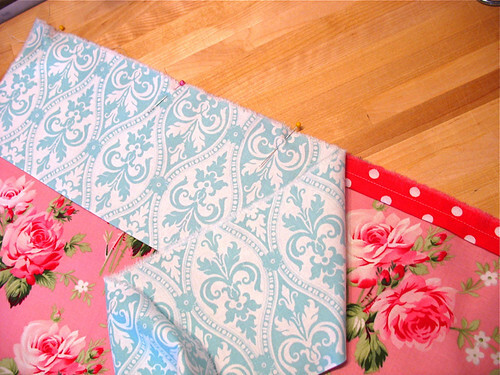 Take your time to make sure all the seams match up and especially that the top matches up evenly. Use lots of pins if that makes you feel safer (it's not a sign of weakness and don't let anyone tell you that it is!). Now stitch from the top down past the seam with the red strip. I use my regular machine to start the seam because I can get the edges to match better this way (they tend to shift apart if I use my serger to start the seam). At this point I remove it and use the serger to finish it. If you are using your regular machine just go ahead and finish the seam all the way down the side and then across at the bottom (then zigzag your edge). Trim your threads and press the seam to the side. 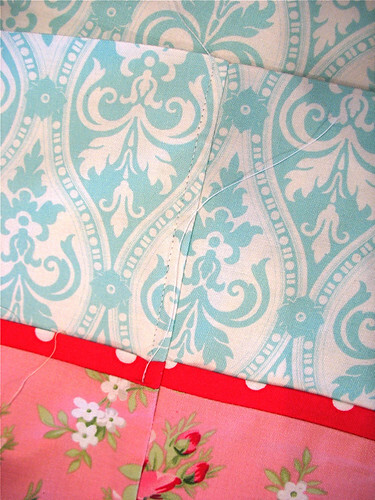 On the right side of the fabric topstitch along the side of the seam so that your seam allowance is stitched flat in place. 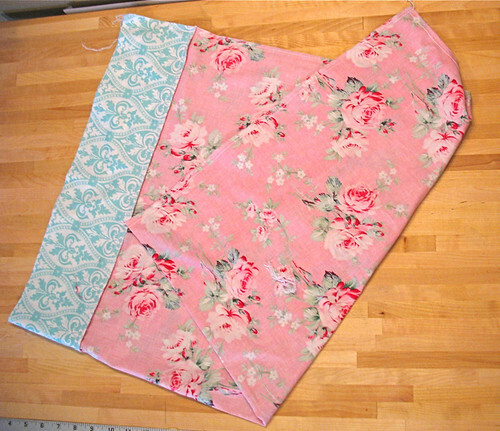 I only do this through top part of the pillowcase where the sloppy seam would show (but now it's not sloppy because you've stitched it down, yippy!). 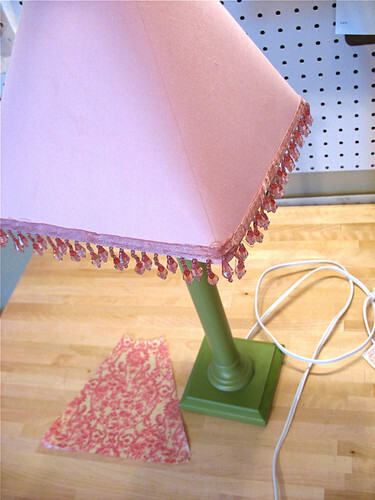 After I finished the pillowcase I realized that lamp needed some re-vamping (kind of like "If you give a Mouse a Cookie", there's always one more thing to decorate). Here's the old look. I peeled off the old fabric (which was just some peel and stick fabric I found a few years ago) but kept it to use as my pattern. 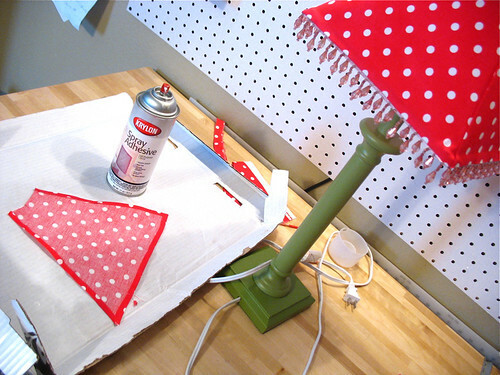 I used this spray adhesive for the back side of the fabric (great stuff! 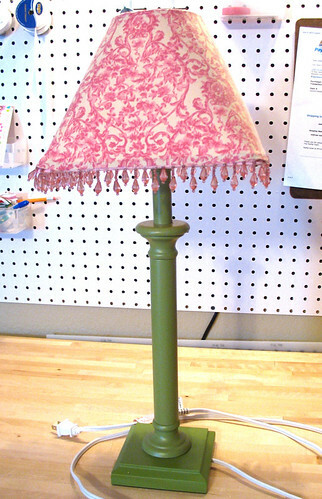 ), and carefully smoothed the fabric in place on the lamp. I finished the top and bottom with some folded bias strips (I used my glue gun for this part and didn't burn myself once!). 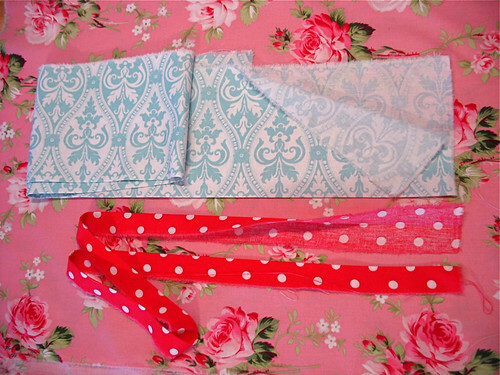 I love using striped fabric for making bias tape because then it tilts like barbershop pole stripes. Fun! So here is my finished set and it was so fast! !